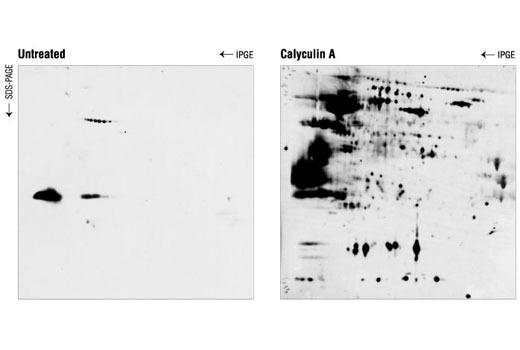 Western blot analysis of extracts from Jurkat cells, untreated or calyculin A-treated (0.1 µM for 30 minutes prior to lysis), using Phospho-(Ser/Thr) Akt Substrate Antibody. Proteins were separated by 2-D electrophoresis prior to blotting. 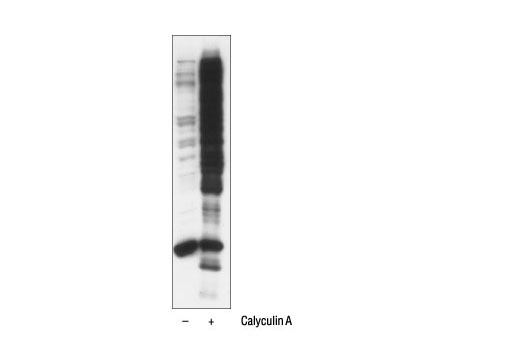 Western blot analysis of extracts from A431 cells, untreated or calyculin A-treated, using Phospho-(Ser/Thr) Akt Substrate Antibody. 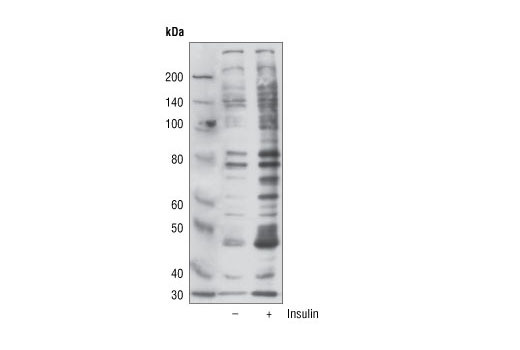 Western blot analysis of extracts from C2C12 cells, untreated or insulin-treated (100 nM for 15 minutes prior to lysis), using Phospho-(Ser/Thr) Akt Substrate Antibody. 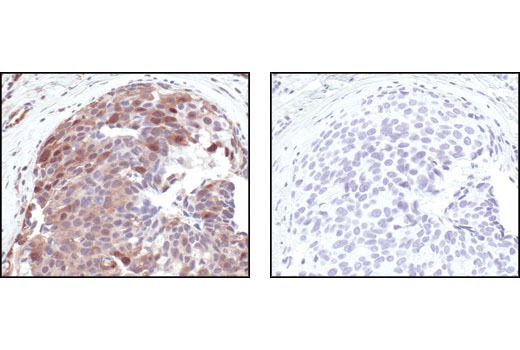 Immunohistochemical analysis of paraffin-embedded human breast carcinoma control (left) or lambda phosphatase-treated (right), using Phospho-(Ser/Thr) Akt Substrate Antibody. 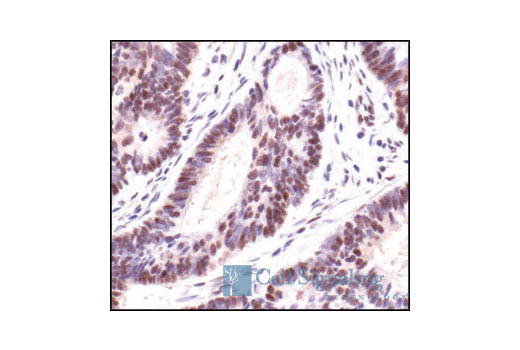 Immunohistochemical analysis of paraffin-embedded human colon carcinoma, using Phospho-(Ser/Thr) Akt Substrate Antibody. 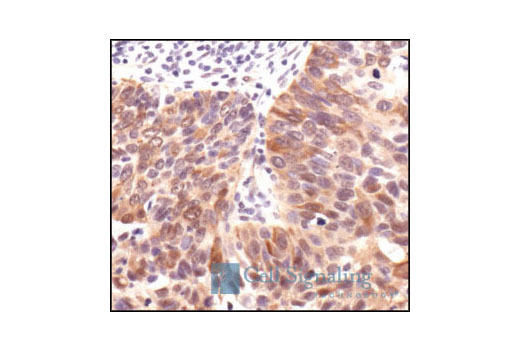 Immunohistochemical analysis of paraffin-embedded human lung carcinoma, using Phospho-(Ser/Thr) Akt Substrate Antibody. Phospho-(Ser/Thr) Akt Substrate Antibody preferentially recognizes peptides and proteins containing phospho-Ser/Thr preceded by Lys/Arg at positions -5 and -3, in a manner largely independent of other surrounding amino acids. Some cross-reactivity is observed for peptides that contain phospho-Ser/Thr preceded by Arg/Lys at positions -3 and -2. No cross-reactivity is observed with the corresponding nonphosphorylated sequences or with other phospho-Ser/Thr-containing motifs. 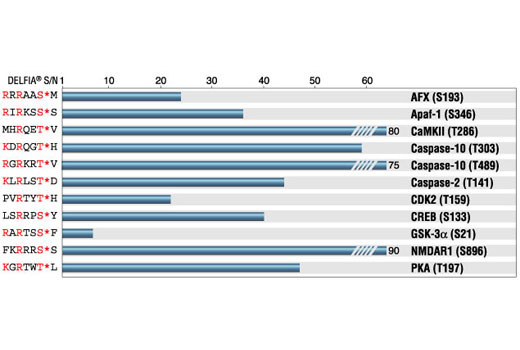 By ELISA, the antibody recognizes a wide range of phosphorylated Akt substrate peptides, and, by 2-D gel Western blot analysis, it recognizes a large number of proteins presumed to be Akt substrates. Polyclonal antibodies are produced by immunizing animals with phospho-Akt substrate peptides . Antibodies are purified by protein A and peptide affinity chromatography.